"Stirrup Jackets in White Gold"
Stirrup Earrings, the Gorgeous Horse is your number one source for custom equestrian jewelry. Cute, small little stirrups, would be great for the little rider in your life or for anyone looking for a small, subtle look and lighter feel. 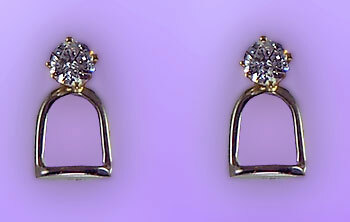 Available in 14kt yellow or white gold or sterling silver.